ABOVE: Christiania on a damp winter day. Drugs (both hard and soft) are illegal in Denmark, but they're certainly available--and according to Danes who have followed the issue, crackdowns on hashish dealers in Christiania have led to drug sales and gang wars in other neighborhorhoods of Copenhagen. At this caf� in Christiania (see below), roaches are likely to be found in ashtrays, not in the kitchen. In 1970, young Danes broke into an abandoned military barracks complex and turned it into a squatters' camp. Today, after 40 years of not always peaceful coexistence with the government, Christiana struggles to maintain its role and reputation as a "free city" of hash dealers, political idealists, and aging hippies. 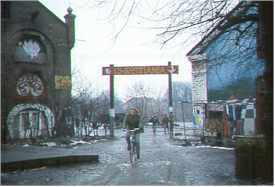 Only a few pages of this site are in English, so if you don't read Danish, see Wikipedia's article on "Freetown Christiania."